Master Chander Sindhi Folk Music Signer. He was born on 07 December 1907 in Tharoo Shah, District Nawab Shah Sindh with Zamindar family, where singing was considered a ‘Taboo’. 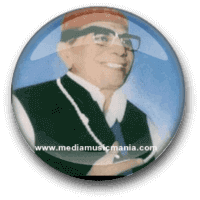 He was great legendary Sindhi Classical Music, Sindhi Lok Music Singer.He sung songs in his own style and he was singer of love and affection with Sindh and Sindhi language. He create great name in Old Indian Sindhi Songs. He conveyed different messages to society at different times. He sung songs in praise of Hindu and Muslim Unity and after partition. Master Chander entered into Bombay Film Industry and was the hero and also the playback Artist for "Maut Ka Toofan". He had sung playbacks for Sindhi Hindi Movies and even today one can hear the popular bhajan "Urr Ja Hans Akela" on the Vivid Bharati. Master Chander had a passion for Music from his childhood. Master Chander renderings kept the audience spellbound for hours during his career as Singer for 47 years. Master Chander was called the Master of Sindhi Musicians. He was first to sing Sindhi Sufi Kalams and songs related to love in Sindhi Language, he was started singing at the age of 12. Sindhi listener in all over the World always remember to Master Chander. I have selected below most popular Super Hit Music of Master Chander. This great Sindhi Artist was died on November 1984.